The New Process / New Venture 231 transfer case is one of the most durable and rebuildable transfer cases in the history of Jeeps. Included in the 231 master kit is the chain, which we do not consider to be an optional rebuild item like so many others do. This is the highest grade chain available. 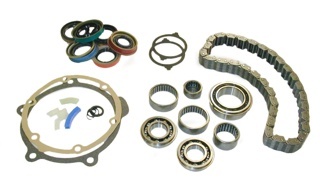 All kits include all the bearings, seals, gaskets, small parts, chain, and instruction guide. NP231's are consistent from 1988-1993. Beginning in the 1994 model year, New Venture changed the front input bearing from a wide version to a narrow version. By 1995, the change-over was complete, but individuals with 1994 model year transfer cases can't always be certain of which bearing their transfer case may actually have, unless they pull the front bearing retainer or even fully disassemble the NP231 and check this input gear bearing. The earlier style input gear, left, has a wide bearing journal. The later style input gear, right, has a narrow bearing journal. For a more in-depth discussion of these versions, see this page. See this page for upgrade components to make your 231 stronger. 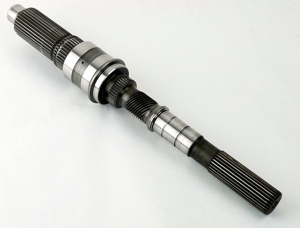 The NP231 is surprisingly strong in nearly all areas, but occasionally, the output portion of the Jeep 26 spline to break under shock loading or other high-torque conditions. These factory mainshafts are good used units pulled from transfer cases that have come across our benches for slip-yoke-elimininator kits. They have been hand selected, inspected and are in great condition to bring a factory style 231 back into the game. Image for later version shown. Earlier version similar. TeraFlex's 2Low kit will give you true low range gearing without eliminating the ability of the front to freely turn. This kit is purely internal, and requires no external modification. The shift pattern for your transfer case will be 2H > 4H >N >4L > 2L. These kits are only compatible with the 231-J transfer cases. Essentially all parts for the 231 are available new and affordably so. For anything not shown, contact us. It is very common for our customers to do top-level rebuild work, using good methods and by following our included instruction guide. We suggest the rebuilder have access to a set of snap ring pliers, and a small arbor press, in addition to standard shop tools.